Artist Johnny Freedom works on a Wichita flag-themed table. Chances are you’ve seen the Wichita flag popping up around town. The flag's three components represent happiness and contentment, a permanent home, and the freedom to come and go. KMUW’s Abigail Wilson spoke to several people who are on the forefront of the movement. At the center of Old Town at an intersection near Washington and Douglas, on an old brick building, is a small mural of a red, white and blue flag. It’s not the American flag--it’s Wichita’s. It was adopted in 1937 as part of a contest. It has a white circle around a field of blue with a Native American symbol for the sun drawn in white. All together, that symbolizes a permanent home. Surrounding that are red and white alternating rays that expand to the edges. It’s flown at City Hall and Century II. It’s printed on t-shirts and mugs. So where has this flag been for nearly 80 years? And what’s the deal with what some describe as a resurgence in Wichita pride? Local artist Chris Gulick says “resurgence” isn’t the right term. 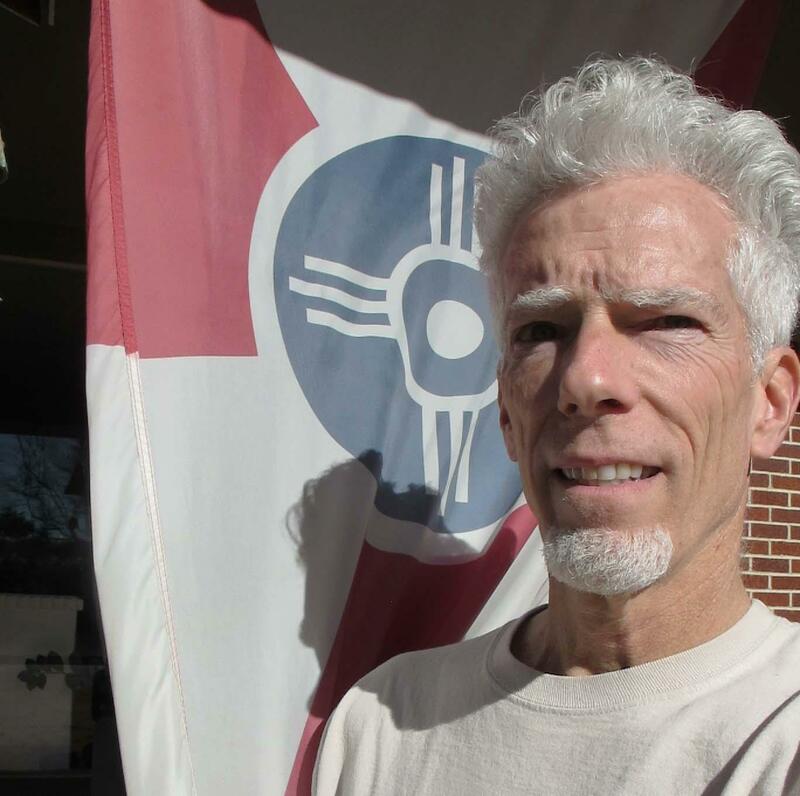 Artist Chris Gulick stands before a Wichita flag. Gulick says that around 20 years ago, he noticed the being flown at Century II but nowhere else. The image is public domain: No one owns it or the rights, making it free to be used or modified by anyone. So Gulick rallied some local artists to try their luck at promoting the design to fill a void that was perceived by some Wichitans. “Seeing this flag, I went, ‘Well, why do we keep hearing people complain about our self-esteem, or we need a catchphrase? Why do we keep having these arguments?’ Because here’s this thing--why don’t we just make use of it?" he says. They printed the Wichita flag on ornamental license plates, but the products didn’t go over well. Gulick’s story is the complete opposite of what is currently happening with the Wichita flag, but if he’s bitter about it, it doesn’t show. He credits Millennials with the recent success. “I am just ecstatic that your generation has picked this thing up, after guys like me turned gray, and used it for what it is: a graphic symbol with which to rally around your own local pride," he says. 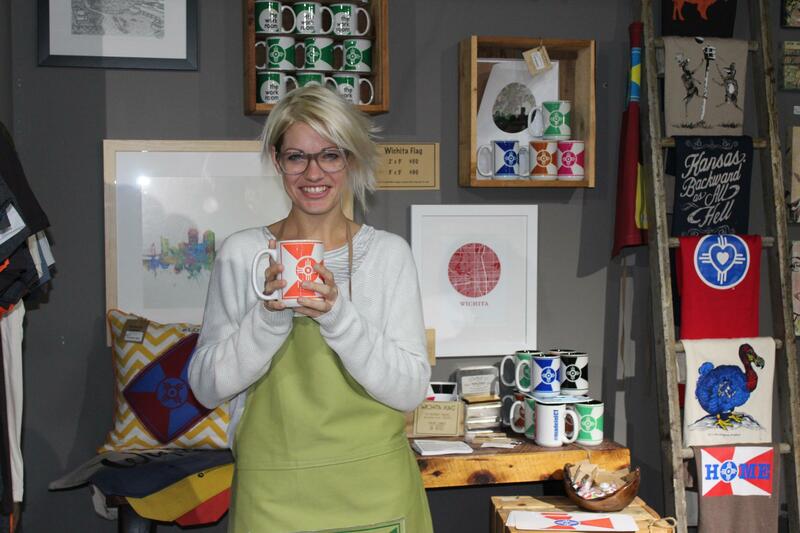 Wichita flag merchandise lines The Workroom, where everything from flag pins to t-shirts to home decor is sold. 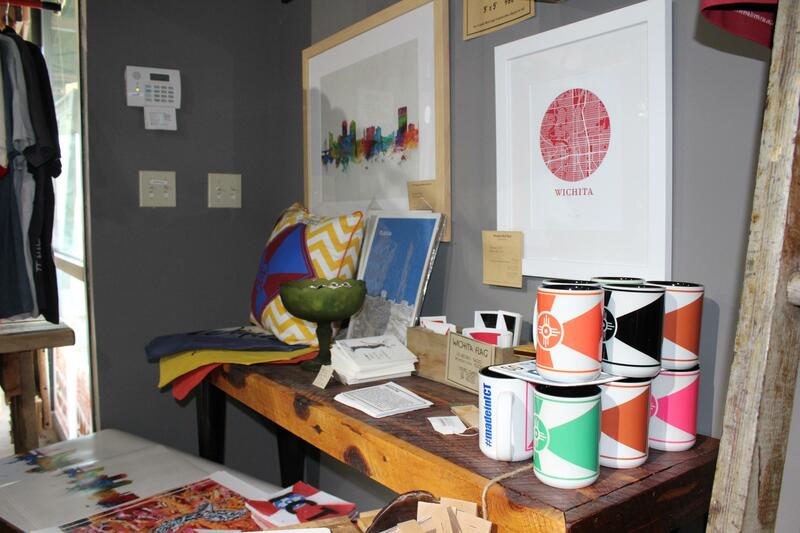 One place where plenty of Wichita pride can be found is a small, quirky store called The Workroom. Janelle King runs the business, which specializes in custom drapery and upholstery. King says starting about two years ago, The Workroom became one of the few places to find Wichita-flag-themed merchandise--and it’s all locally sourced. This increased supply and demand of the flag gives rise to one question: What came first for this recent movement, the Wichita flag or the Wichita pride? Janelle King stands with some of the merchandise sold at The Workroom in Wichita. King says it's the pride. Wichita has consistently had a problem with brain drain--a stagnant economy and lack of jobs leading to the mass exodus of educated young people. That included King, who for a time moved away. But she says now that she’s back, she feel the city has, over the years, turned out to be pretty cool. "It’s just starting to steamroll. Our coffee culture has just exploded, all of the local breweries and stuff, the food truck culture. All of those things are really what’s going to help the city grow. And I feel like hopefully we’re doing our part in that too," she says. Another organization that has been working to highlight Wichita pride is the city’s Chamber of Commerce. Angie Elliott is the director of business services for the chamber. She started wearing a circular flag pin of the flag on her lapel early this summer after she found some for sale at The Workroom. “People asked me, ‘What’s that button? What is that?’ And I said ‘Well, it’s the Wichita flag,'" Elliott says. "And they’d look at me kind of strange and say, ‘What are you talking about? I didn’t know we had a flag. I’ve lived here my whole life. I didn’t know we had a flag.' And I said, ‘Well I’ve lived here my whole life too and I didn’t know we had a flag but we do!'" That gave her the idea to give people their own flag button to in turn give to someone else. 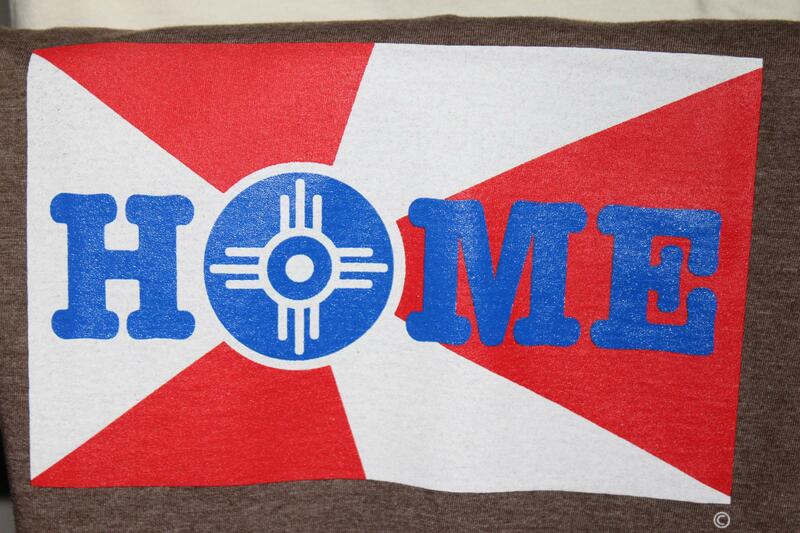 A t-shirt bears the Wichita flag. She’s right--just look around. The flag has become meaningful to a lot of people around town, especially local businesses, where the design is used on tabletops, on the walls, and within logos. 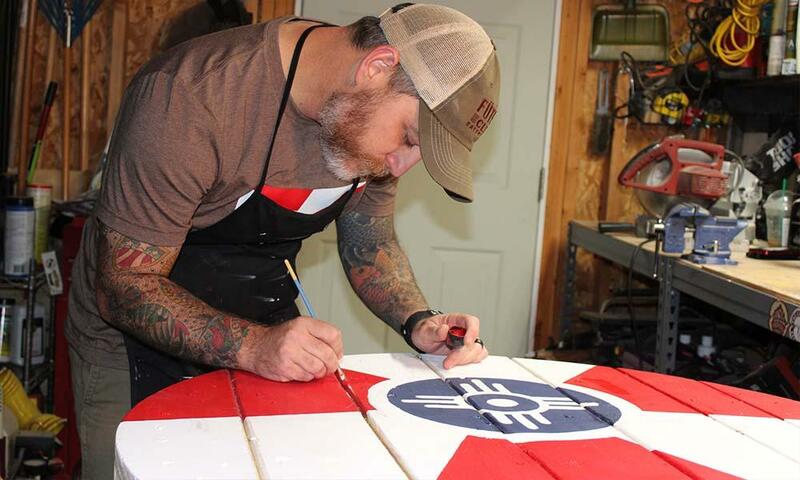 Wichita artist Johnny Freedom calls himself more of a handyman than an artist, but his work, which features the Wichita flag, the Keeper of the plains, and other Wichita-esque symbolism, has taken off in the past year. He uses latex paint, wooden pallets, old fences, antique doors, anything he can find to make one-of-a-kind pieces of art. "The mentality I think we’re seeing here in Wichita is...not stemming from the flag, but the flag being part of it is people taking pride in our community but also taking steps in order to make sure local business grows here, flourish, and support our economy," Freedom says. So the Wichita flag, which had seemingly been lost for decades, is back. And for Chris Gulick, whose vision of the flag being flown high over town is finally being realized, it’s not about who started the movement or why. "So really a big thank you to you and your generation for taking this symbol and running with it like what it is… a flag of patriotism," Gulick says. Whether it’s a symbol of Wichitans' longstanding love for their city or a catalyst for newly found pride in a younger crop of citizens, it’s hopefully here to stay--representing the freedom to come and go as you please. Follow Abigail Wilson on Twitter @AbigailKMUW.